Jack’s Bar-B-Que on Broadway. Photo: Spencer Davenport. Editor’s note: This post is part of a series themed to Project: Time Off, a national advocacy campaign created by the U.S. Travel Association. Visit Seattle is committed to promoting the importance of travel and we remind our hard-working team members with a “Spontaneous Getaways” program. Each quarter, we award one employee a trip of their choosing. We provide the transportation and allocate extra paid time off, they return rejuvenated and sometimes even write about their travel experiences. We hope this post inspires you to book your own trip soon. Join the social conversation at #projecttimeoff and #takeaday. 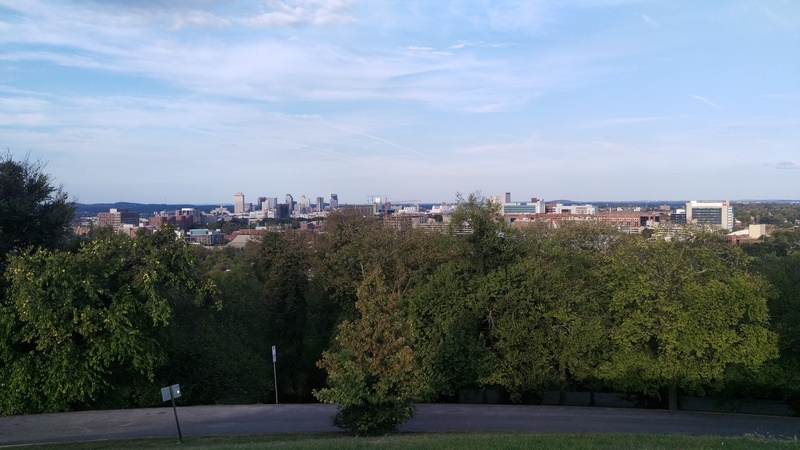 Last month, I had the incredible good luck to be awarded round-trip airfare to the Athens of the South, Music City itself: Nashville, Tennessee. I was thrilled at the chance to go somewhere new and exciting across the country, but I knew very little about the place. As a naturalized Seattleite (I was born and raised a Texan, but they let me work here anyway), I’m far removed from what’s happening in the true South. I had some vague idea of what went on in Nashville: country music, fried chicken, “hot chicken,” more country music, cowboy boots, possible hootenannies and my girlfriend told me Taylor Swift is from there. My point being, I was definitely a blank slate, ready to soak in as much of the city as I could. Alaska Airlines cockpit tour, thanks to First Officer Eric Mueller. Photo: Sarah Anthony. I was fortunate enough to be on the inaugural flight of the newly-opened Seattle-Nashville direct route on Alaska Airlines. 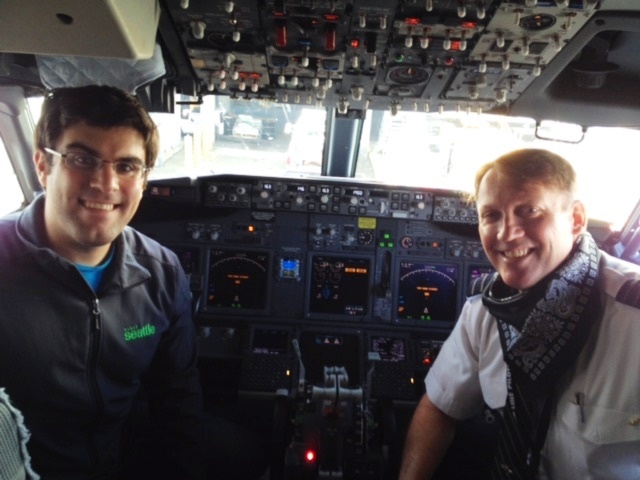 It just so happened that I knew the first officer of the flight, Eric Mueller, and he brought me in to the cockpit! It was thrilling to get a pilot’s perspective, although it is staggering how many buttons are crammed in that little space. I was nervous I would accidentally hit a “Make Plane Fall Out of Sky” switch or something. The Nashville skyline. Photo: Spencer Davenport. It’s easy to forget just how big the continental United States is. In terms of driving distance, Seattle and Nashville are just shy of 2,400 miles apart. For comparison, Seattle to Tijuana is under 1,300 miles. You can drive from Paris, France, to Warsaw, Poland, in a little over 2,200 miles. Sure it’s still the good ol’ U.S. of A., but going that far you find yourself with a different flavor of United States. Some of the differences are obvious: different coffee shops, more plentiful barbecue, a hint of Southern twang from the folks you talk to, fewer Space Needles around. But some of the differences are subtle: the wind smells different, the grass is springier, the sky is just a little bit bigger. Sure, everybody wants to go to far-off exotic locales on vacations. It’s important to remember, however, that new and fascinatingly different places can be found without even needing a passport. 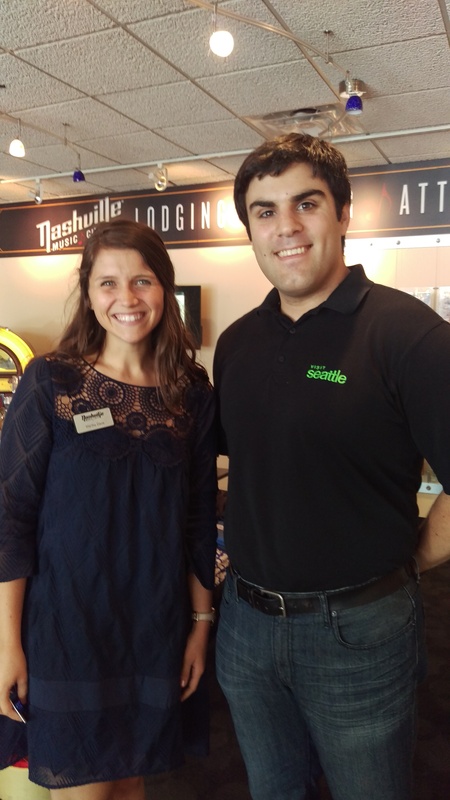 The Visit Music City Visitor Center, with thanks to Martha Davis for orienting me and lending some great city passes. Photo: Sarah Anthony. 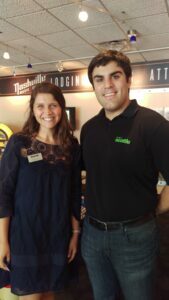 I stopped at the Visit Music City Visitors Center for a chat with Martha Davis of the marketing team. She was a wealth of information about what there was to do in town, and we traded stories about our favorite frequently-asked questions about our respective cities. Naturally, one of mine was “So it ALWAYS rains in Seattle, right?” (No it does not, much less than many other major U.S. cities, actually). She presented me with a Music City Backstage Pass, an exclusive voucher that got me into many of Nashville’s top attractions. 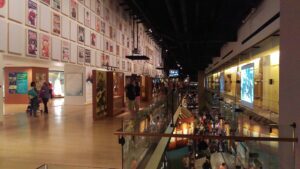 If you’re ever planning a trip to Nashville, I highly recommend looking into their Total Access Pass, which will let you do many of Nashville’s must-do activities at a considerable discount and is a fantastic deal. They can be purchased online or at their Visitor Information Center in Bridgestone Arena downtown. Nashville is “Music City,” so I had to start my trip at one of the most famous performance venues in the country, “The Ryman.” The Ryman Auditorium is the “Mother Church of Country Music” and for decades has been considered one of the best performance venues for any musical artist (check their events calendar, they still draw amazing acts). I was surprised to find out it was originally a church started by a riverboat captain famous for breaking up revivalist tent sermons, who one day became an instant convert and immediately began raising the money for a church. 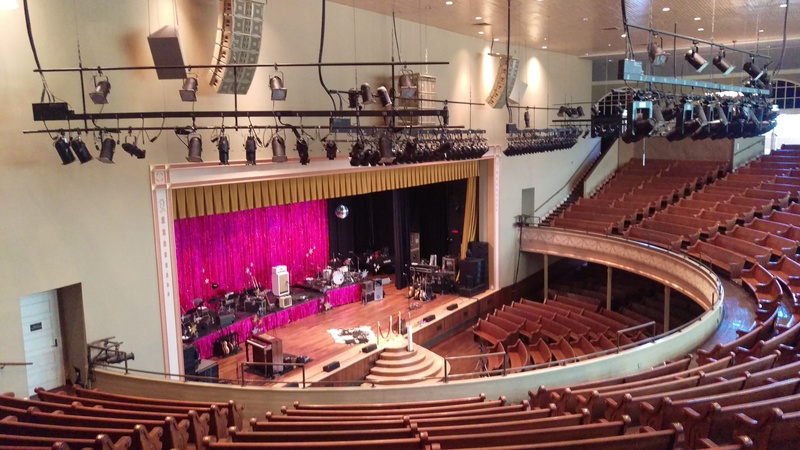 Walking around that venue and sitting in the pews (the Ryman still uses pews instead of theater seats, as a nod to the venue’s more spiritual origins), you can practically feel the energy of the countless people that gathered to see countless more artists and speakers in that hall. The kind of energy that would motivate a man to drop everything and build an auditorium, and the kind of energy to move audiences of thousands over the years. The Country Music Hall of Fame.Photo: Spencer Davenport. Just a few blocks from the Ryman is the Country Music Hall of Fame, testament to the genre that Nashville studios helped turn into a multi-million dollar genre. Even if you’re not a self-described fan of country music, even if you’ve never driven a pickup truck and don’t own cowboy boots or say “y’all,” it’s still worth it to tour this museum. The stories of the performers and the artifacts on display really bring the spirit of the music and the people who made it to life. Also in the Country Music Hall of Fame complex is the historic letterpress shop Hatch Show Print, which has been producing amazing posters and art for well over a hundred years. The gallery creates new and innovative works while still keeping the spirit and traditions of letterpress alive, and the designers still use tools and equipment that dates all the way back to when the shop first opened. The signature Hatch style (which you probably recognize) has inspired designs and artwork in countless mediums, and it was a great experience to see where it all started. Elvis’ “solid gold” Cadillac. Photo: Spencer Davenport. And if all that still doesn’t do it for you, you can drool over the amazingly opulent cars on display. 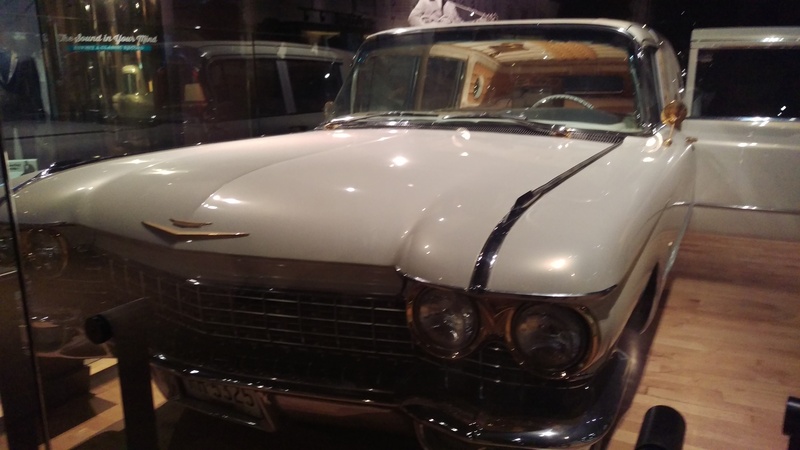 Webb Pierce’s convertible has pistols for car handles! 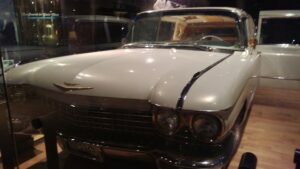 Elvis Presley’s Cadillac had gold-plated practically everything! Kolaches at Yeast Nashville. Photo: Spencer Davenport. Taking in the history and music of a new city works up an appetite, and Nashville has mouth-watering offerings to suit any taste. For breakfast, I loved Biscuit Love’s menu, with their perfectly stick-to-your-ribs-but-not-too-heavy biscuits. It’s located in a trendy part of town called The Gulch, with several popular and historic music venues nearby. The East Nashville district also has several great breakfast and brunch spots, and I highly recommend both Bagel Face Bakery (amazing bagels!) 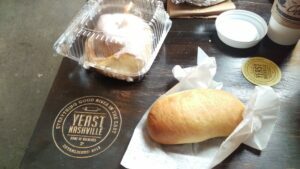 and Yeast Nashville (killer kolaches and other pastries, AND a clever pun in the title!). 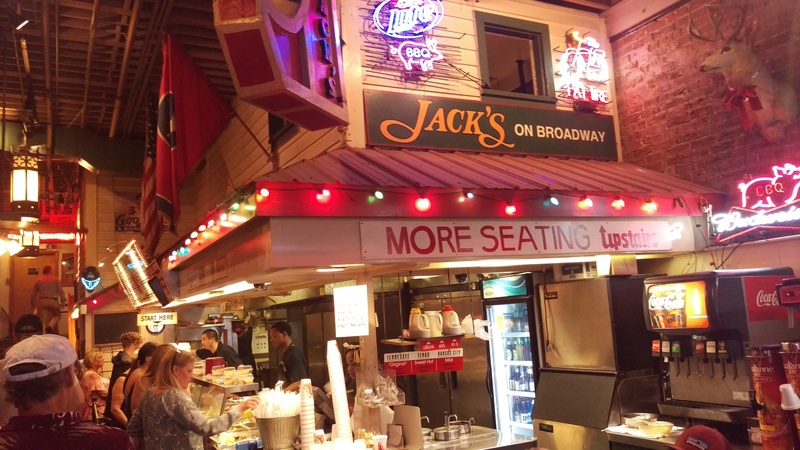 Jack’s Bar-B-Que on Broadway is a local institution, and after a full day running around everything that downtown Nashville has to offer, their pork shoulder and cornbread made me refreshed and happy and a better person. Fried Chicken at Hattie B. Photo: Spencer Davenport. Speaking of food, Nashville has a specialty of “hot chicken,” a spicy twist on fried chicken. 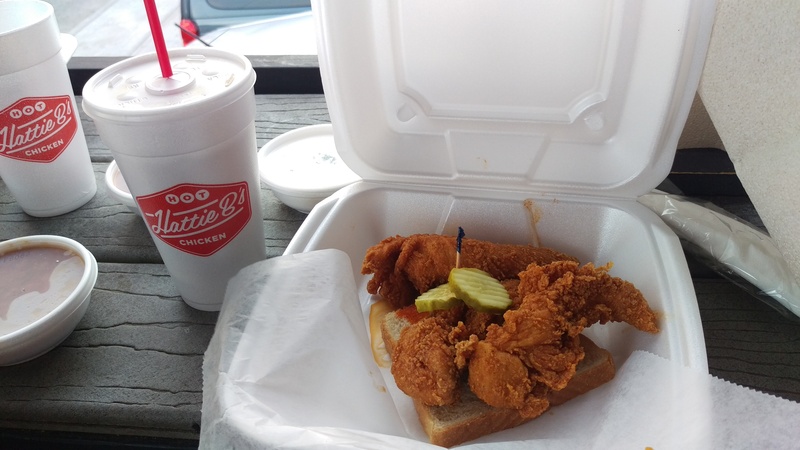 Many restaurants offer it, but for a true Nashville experience, I recommend Hattie B’s Hot Chicken. The chicken is cooked to perfection, the staff is friendly and quick to move through the line (and with a place this good there’s ALWAYS a line), and the heat of the chicken goes from “Southern” to “Shut the Cluck Up.” I opted for “Mild” heat, and it was just enough to enhance the flavor without setting my mouth on fire. Encounters with local wildlife. Photo: Spencer Davenport. Nashville also has lots of natural beauty to take in. Centennial Park is gorgeous, often has musical performances and festivals (as do most places in such a music-oriented city), and has the world’s only full-scale replica of The Parthenon, originally built for the 1897 Centennial Exposition. Although it may seem out-of-place at first, it actually fits very nicely in the scenery of the park, regally overlooking the greenery and fountains. 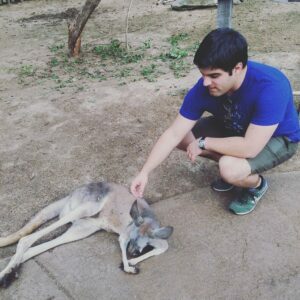 The Nashville Zoo at Grassmere is also absolutely worth a visit, and is just finishing off some major renovations and updates to make it better than ever. I even got to pet a kangaroo! Although it’s more manufactured natural beauty, it is absolutely worth taking a stroll through the nine acres of indoor gardens at the Gaylord Opryland Resort and Convention Center. The river and waterfalls (yes, multiple waterfalls) are gorgeous, and their annual Country Christmas pageantry draws visitors from miles around. The Grand Ole Opry.Photo: Spencer Davenport. My biggest take-away from Nashville was that it is, and always has been, a city of inspiration. After the Civil War, the city took advantage of the winding Cumberland River (beautifully scenic, and has a great downtown park), boomed with new growth and industry, and it doesn’t seem to have slowed down since. 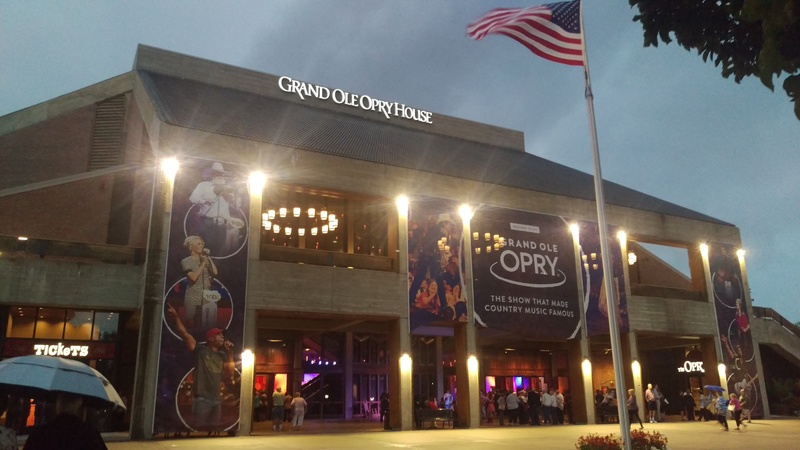 The city launched country music and the Grand Ole Opry into American pop culture, and when the show outgrew the Ryman and it fell into disrepair, the community and the musicians it inspired rallied together to rebuild it better than ever. When flooding in 2010 caused severe damage to many Nashville city landmarks, the community made sure to restore and re-open the artistic landmarks that were the soul of the city. Today the city continues to be a source of inspiration: Nashville has over 20 post-secondary educational institutions, over 700 churches, and many successful studios and record labels, all of which continue to inspire and support the innovators and artists of the future. So my take-away for you, dear blog-reader and traveler enthusiast, is that if you ever have the opportunity to visit Nashville, make sure you do. The city’s spirit, its history, its music, and everything else it has to offer might just inspire you like it has so many others in its history. And don’t forget the hot chicken! 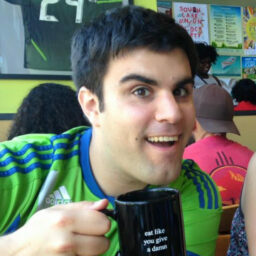 Spencer Davenport is a born Texan but a naturalized Seattleite, and a Convention Services Coordinator at Visit Seattle. He enjoys traveling, drumming, local food and drink, movies, and obscure pop culture references.